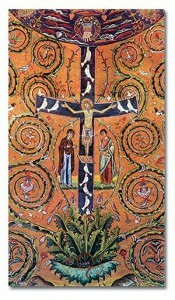 The mosaic centres on the Cross of Jesus. This Cross is the new Tree of Life. Its most prominent feature is a vast vine which is growing out from the base of the cross. The cross emerges out of the tree and is then wrapped with the vines. Branching out from the tree on both sides are swirling vines that cover the entire mosaic. These vines give shelter to all of humanity. They embrace medieval figures from many walks of life. Both Doctors of the Church and peasants are depicted engaged in their daily tasks. The vine is identified as the Church by an inscription in latin written across the bottom the whole scene: «Ecclesiam Christi viti similabimus isti quam lex arentem, sed crux facit esse virentem» (Let us compare the Church of Christ to this vine: the Law made it wither but the Cross made it bloom). Mary and John stand beside the cross and the hand of God the Father is above it. This hand is lifting up all of the vine by means of the cross. The hand of the Father is offering a wreath of victory to Christ. Above all this, over the highest point of the arch, there is the monogram of Christ enclosed in a medallion to symbolise the victory over death by means of the death on the Cross. The early Christians saw this sign everywhere. It was indeed, the axis of the universe itself and drew everything to its centre. The four streams remind us of the four rivers of Eden (Genesis 2, v.10-14). 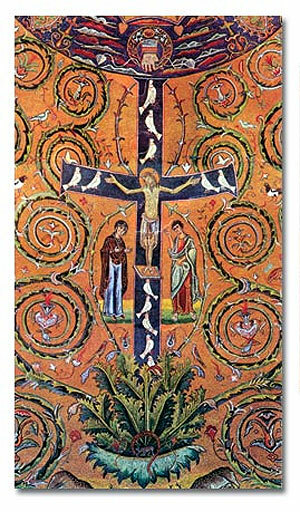 But in the mosaic these rivers are flowing from beneath the Cross. Paradise is now restored. 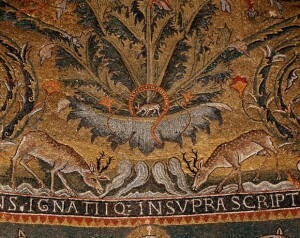 The two deer drinking from these waters recall psalm 42.1: «As the deer yearns for streams of water, so my soul is yearning for you, my God». 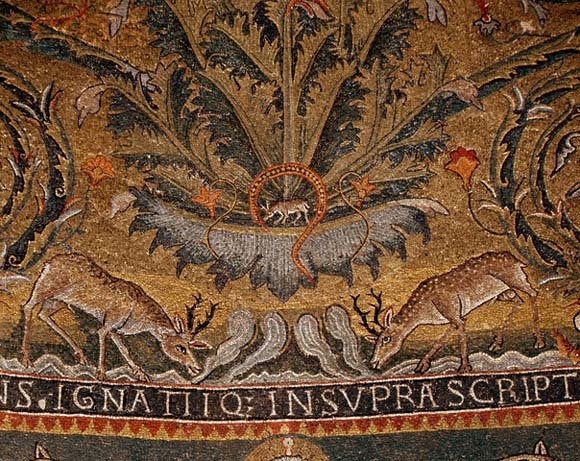 But this psalm now takes on a renewed significance: the deer are drinking the life-giving waters of Paradise. These same waters are nourishing a beautiful array of images: birds, hinds, baskets filled with fruit, a shepherd minding his sheep and a woman feeding her chickens. And not least we see two peacocks, one on each side of the deer. According to ancient beliefs, the peacock had pure immortal flesh – therefore they became associated with the resurrection of Christ. Taken together, these images remind us that all things in nature and culture find their origin in the life-generating power of the Cross. These are just a few of the numerous symbols in the mosaic. During these sacred days of Holy Week and Easter our meditation on the Pascal Mystery can be inspired by this masterpiece of medieval art in San Clemente. This tree of heavenly proportions rises up from the earth to heaven. It is fixed, as an eternal growth, at the midpoint of heaven and earth. It sustains all things as the support of the universe, the base of the whole inhabited world. Established by the invisible pegs of the Spirit, it holds together the various aspects of human nature in such a way that, divinely guided, its nature may never again become separated from God. 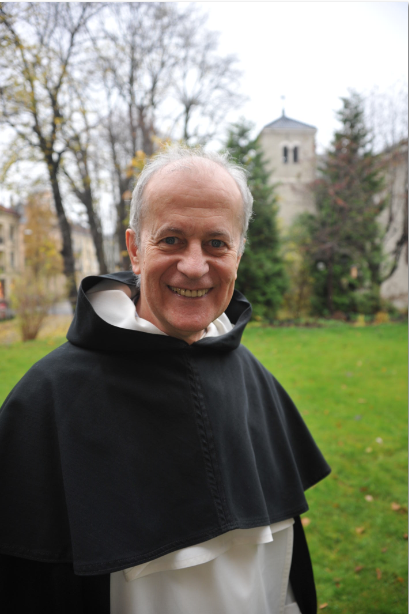 By its peak which touches the height of the heavens, by its base which supports the earth, and by its immense arms subduing the many spirits of the air on every side, it exists in its totality in everything and in every place.» (De Pascha Homilia 6, Migne PG 59).